RapidFix is a scientifically developed dual-component adhesive system comprised of a powerful, instant bonding adhesive and Welding Powder. The adhesive can be used alone or can be combined with the Welding Powder. The powder is formulated to harden instantly when it comes into contact with the adhesive. Together, the two are used to make repairs similar to a weld, as well as filling holes, gaps, and cracks. The adhesive dries crystal clear so it is perfect for use on glass and ceramic repairs. The welding powder hardens opaque-white and can be painted immediately. The hardened welding powder can be instantly drilled, sanded, ground, filed, and painted. The RapidFix Dual Adhesive System has a wide range of applications. It can bond almost any material to itself or to another material. Those materials include: rubber, glass, copper, aluminum, steel, and most plastics. It can be used to fill wood and ceramic as well as other non-porous materials. RapidFix will save you time and money. Your Home, Workshop, or Emergency toolbox should not be without this amazing product! 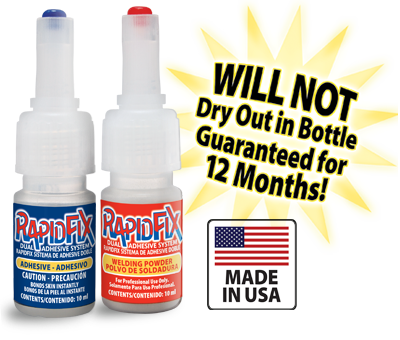 Whether At Home, At Work, On the Road, On the Water or Even at Play, RapidFix can make simple emergency repairs wherever they happen!